13-May-2017 -- From 40N 95W, I drove eastwards along freeways and country roads to reach this ‘Forgotten Degree Confluence Point’, which had been visited only once before, more than 16 years ago in March 2001. 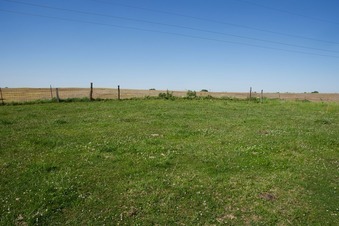 The point lies in a farm just 1/4 mile north of July Road (a gravel country road). To reach the point, I crossed a barbed-wire fence, skirted a small pond (disturbing three geese), then crossed a couple more barbed-wire fences, to reach the point, which lies in a grassy farm field - just south of a much larger field (that is currently bare). The pond is visible to the east. Shortly after leaving the point, I drove past (a different) farm entrance where, proudly flying, was both the American flag, and the Confederate battle flag. This served as a reminder that I was far from my home in California.